Do you wish you had more cash for books, travel, or even tuition? 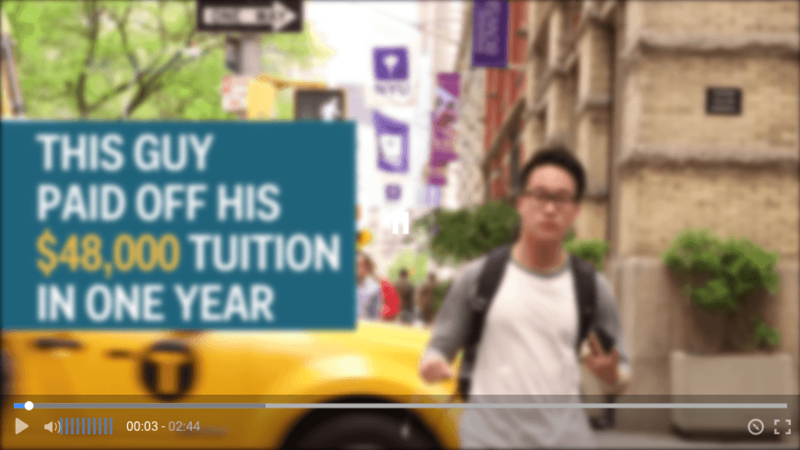 You could take out a student loan, sure, but you could also do what this NYU undergrad did – earning more than $48,000 per year. The cause (and solution) to these mistakes is the subject of another post, but they could have been prevented altogether if I understood how simple making money could be in college. In fact, it’s possible to get great work experience you can later leverage with employers. NYU student Eric Hu figured this out. Though he’s studying marketing, not English, there’s so much for English majors to learn from this example. Click the image to view the video on Business Insider. If Eric can do this in New York City where living expenses are crazy high, you can do this where you live, too. What can we take away from Eric’s story? Have a clear goal. In Eric’s case, it’s enough to cover his tuition and other expenses. 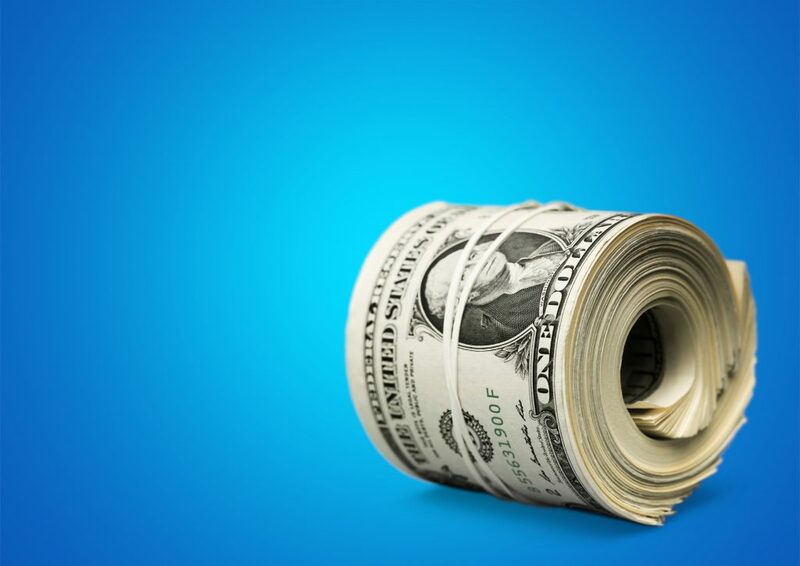 If you set a similarly clear income goal, you’re more likely to make it happen. Be willing to do more. Eric’s classmates likely aren’t working as hard as Eric. If you’re willing to work like others won’t now, you can live like others can’t later. Love your work. One of Eric’s greatest advantages is that he loves work. Learning to love work is like not being bored: it’s a skill that’s learned rather than something you’re born with. When you love work, putting in an extra 10-40 hours per week won’t feel like a chore. Pick good opportunities. Notice how, in the video, Eric isn’t working a fast food job. He’s applying for internships and other opportunities that give him practical experience. This has already led him to 6 clients and a big pile of great job experience. Treat yourself. Eric isn’t just spending all his money on tuition; he’s also planning travel. This helps make work feel worth it on rough days. Since an English degree is so versatile, there are many different jobs you can do as a student – online and offline. Plus, by learning how to freelance now, you’ll have a skill you can rely on when times get rough (such as if you get laid off a job). Don’t wait for permission. Start following Eric’s example now. Get News, Tips, and Free Bonuses to Help You Get a Job. Join our free member library to get exclusive resources and get ready for a job this semester. Boring legal disclaimer: English Major's Guide does not act as personal career advisors or guarantee employment as a result of taking one of our programs. 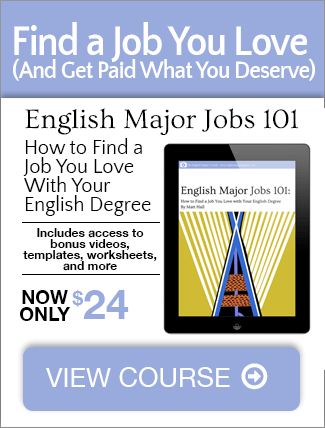 English Major's Guide provides its members with information about improving their writing, technical, design and other skills employers may seek. We believe the information presented to our members in our published resources is the best and most useful available to people interested in studying English while being employable today. The information presented in English Major's Guide programs is for the exclusive use of English Major's Guide members. Copying or disseminating any information published by English Major's Guide, electronic or otherwise, is strictly prohibited. Members should be aware that English Major's Guide is not a school nor does it offer any degrees recognized by employers. Income results may vary.